Johann Mengels Culverhouse (1820-1895) was born in Rotterdam and was known as the “candlelight painter” for his night time paintings. He traveled to Europe and other places while engaging in his artwork. The experiences he gained contributed to his artistic viewpoint and keen perception. Even though he painted for the American audience his style and experience leaked his European style. Not much is known about him other than he sold a number of paintings and died in the 1890’s. 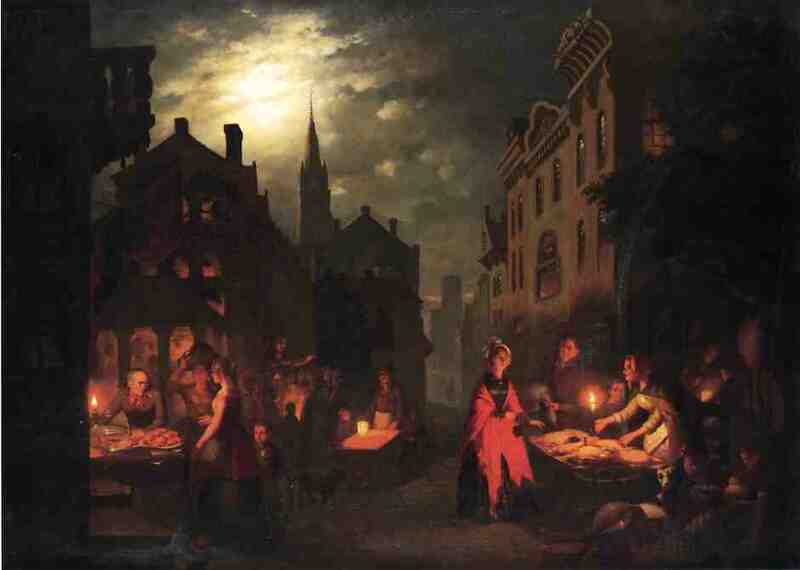 Night markets were customarily less formal than day markets. Many of the participants leisurely walked around, ate food, and had long conversations browsing the area. The scene is set in a European style town with the moon light in the sky and a large church in the background. The buildings are stone and a few lights from the local apartments are apparent. It is a chilly evening with the ladies wearing traditional garb and many of the men in full beards. This is a makeshift market set up quickly for local residents. The painting brings up a feeling of a simple time gone by and intrigue into the early evening. It is a scene of romantic evenings and light shopping. The various nooks and crannies of the painting offer interesting places to look and the moonlight provides a feeling of life in time. Upon each of the tables people have cuddled together furthering this impression of intimacy and togetherness. These are simple city folks buying bread, meat, items and other trinkets for their daily needs.